The expansion of Medicaid to millions of uninsured people should not have the catastrophic impact some predicted for state budgets because the increases in hospital and emergency room usage are only temporary, according to a new study by the UCLA Center for Health Policy Research. Using two years of claims data from 182,000 low-income, uninsured people enrolled in California’s state-run health insurance programs, the UCLA researchers found that people who previously had had the least medical care used hospital emergency rooms at a high rate of 600 visits per 1,000 people. But usage declined sharply in the first quarter to 424 visits (a 29 percent drop), followed by another 25 percent decline the following quarter. Between 2011 and 2013, the overall decline was 69.5 percent (183 ER visits). The report also shows that their hospital admissions declined sharply, from 194 to 42, a decline of 78.5 percent. The Affordable Care Act has extended Medicaid eligibility in 27 states, but many other states have refused coverage in part because of predictions that state budgets would be overwhelmed by the demands of the previously uninsured, particularly once federal subsidies stop covering the full expansion cost in 2017. Three states — Indiana, Missouri and Utah — are considering expansion, and other state legislatures will soon debate the issue. The Obama administration is pushing states to expand Medicaid, arguing that they are not only leaving millions of their residents uninsured, but are also forcing their hospitals to absorb billions of dollars in uncompensated costs for treating people without insurance. The UCLA study looked at data from two programs in California — the Health Care Coverage Initiative, which ran from 2007 to 2010, and the Low Income Health Program, which ran from 2011 to 2013. On Jan. 1, 2014, these enrollees became part of the 1.5 million Californians who were able to transition under the Affordable Care Act into Medi-Cal, California’s Medicaid program that provides health insurance to low-income people. 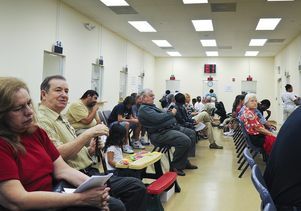 The authors said that because California’s Low Income Health Program had provided preventative medical care and regular treatment for chronic diseases, the newly insured were no longer dependent on emergency room treatment and hospitalization. Improving care delivery through the use of an assigned source of primary care, care coordination and health risk assessments, as well as greater availability of specialty services and culturally competent self-care also potentially helped manage pent-up demand, they said. The UCLA results provide new insights into previously published findings that costly emergency room visits in Oregon increased by 40 percent during the year after the state expanded Medicaid eligibility. By examining data over a longer period of time, the UCLA study was able to determine that such spikes in usage were only temporary. The study was funded by the California Department of Health Care Services and the Blue Shield of California Foundation.